A digital drawing I made of one of my favorite characters in Boku no Hero Academia, Fumikage Tokoyami. I am still practicing digital drawing/painting so this isn't the greatest of work, but I am trying my best! If you like my art, please consider buying me a Ko-fi: www.ko-fi.com/chemicalmechanic . As long as I am credited, I do not mind! I feel the same about Tokoyami. I heard from a friend he gets some time to shine in a certain chapter in the manga so I am looking forward to seeing that animated. I ABSOLUTELY LOVE HIM. REALLY!!???! YES!! I'm so happy he's gonna get some time to shine!! 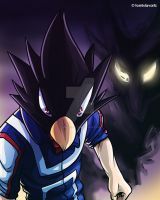 Tokoyami is definitely a favorite in this series! !